I really don’t know where the weeks go you know, I plan my bakes for the weekends but sometimes life generally just gets in the way. This is my bake from last week, a little late and no bake from this week so far as I have had a cold, studying to do and a birthday to celebrate so I will try to make something in the week to “bank” for the blog! My delve into Mary Berry’s Baking Bible dug out the roulade recipe and a tray bake. I made the roulade first. It was Mary’s usual whisk the egg whites together and add the caster sugar – but one teaspoon at a time. Really? The amount of sugar for the recipe, I would have been there all day, adding a spoon at a time and whisking well in between, so I am guilty of not following Mary’s recipe to the exact letter this week- tut tut! Once I had added all the sugar- and yes it was slowly, I poured it into the lined tray, covered the top with flaked almonds and baked for the recommended time. Half way through, you have to turn the oven down and this needs careful timing. Once baked, remove from the oven and allow to cool slightly then turn out onto greaseproof paper. While waiting for it too cool a little more to roll, whisk the double cream and mix the fresh raspberries into it. 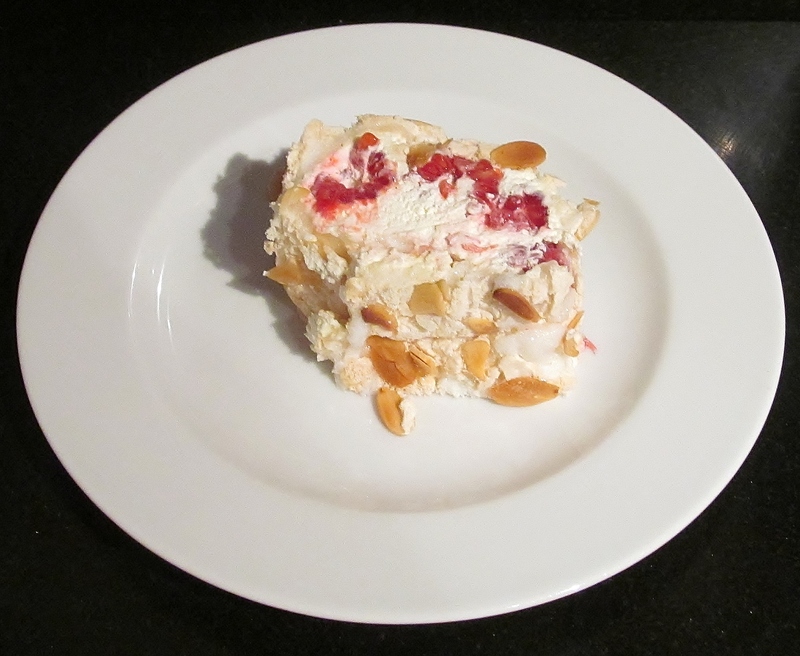 Spread the cream and raspberry mix onto the meringue and use the greaseproof paper to help roll the meringue into a roulade. I thought this would be tricky but I didn’t find it too bad at all. Leave the roulade wrapped in the paper and put into the fridge. 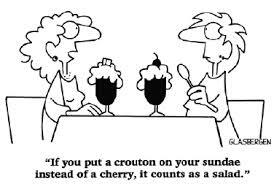 The roulade was really long! 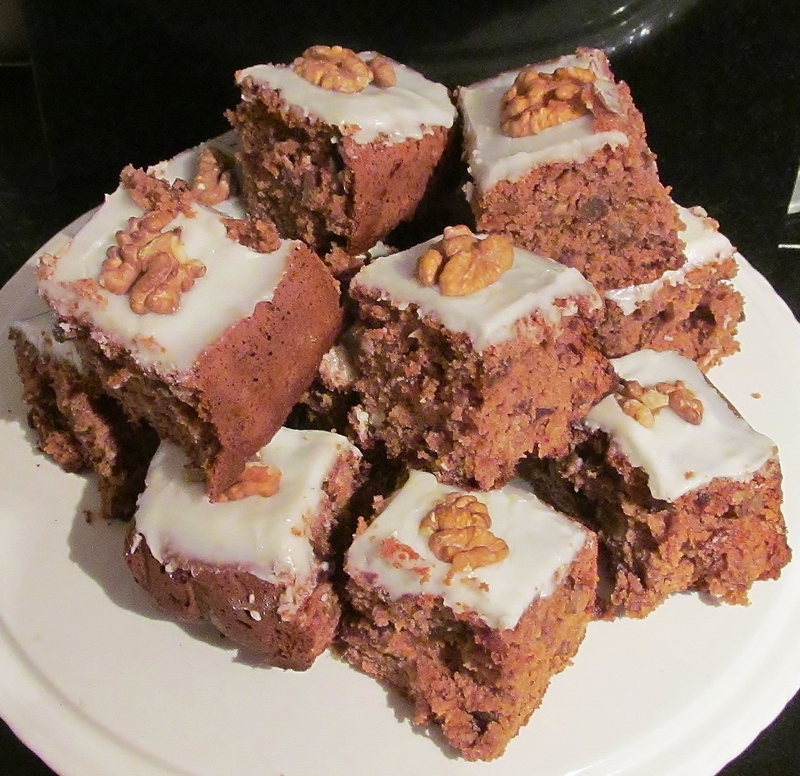 The second recipe was the date and walnut tray bake. Slightly more fiddly in that Mary asks you to cut up the dates, put them in a bowl with the softened butter and some boiling water and allow to cool. In the meantime, put the rest of the ingredients into the bowl and mix, then add the date mix when cooler. Line a tray bake tin and pour the mix in. Cook as per Mary’s recipe. Once cooked, allow to cool in the tin and make the icing topping. I must admit I was a bit dubious about making a lemon icing topping on a date and walnut tray bake but it seemed to compliment it well. Finally decorate with walnut pieces. I divided my bakes as usual and gave some to my chief tasters ….who have now informed me that they are on strict diets so I may have to half Mary’s recipe amounts or I will have to resort to feeding the neighbourhood by putting a table outside! My hubby informs me that our blog has now had over 50, 000 views since we started it – not just for my cake adventures, but also our photography, and Canadian adventure too so thank you all for helping to build up this figure! Oh and my countdown continues…..93 to go….and having a week’s break isn’t helping…..but on a brighter note- the Great British Bake Off starts next week- I will be there, watching every bake! This entry was posted in Kim's cake challenge and tagged Baking Bible, date & walnut traybake, dates, Kim's Cake Challenge, Kim's Date & Walnut Traybake, Kim's Raspberry Meringue Roulade, lemon icing, Mary Berry, Mary Berry's Baking Bible, Mary Berry's Date & Walnut Traybake, Mary Berry's Raspberry Meringue Roulade, meringue, raspberries, Raspberry Meringue Roulade, roulade, traybake, walnuts by kimsideas. Bookmark the permalink.